I saw this picture on Pinterest and thought, oh wow, yummy! We love garlic bread in our house, sometimes to the point that Chiara would rather eat bread than pasta! The original pinner said to start with a loaf of ciabatta bread and slice it length wise in half. I used French bread because it’s what Walmart had in stock. I ended up slicing a couple of pieces out of my two halves, just to make it easier to prepare. Take four tablespoons of butter and stir in three cloves of minced garlic. I used two tablespoons of garlic powder because my mincing skills are not that great. Stir until it’s well combined then spread on your bread. (Haha for rhyming) Take some block mozzarella cheese slices, whether you cut your own from a block like I did or buy pre-sliced, and place on top of the bread. Make sure the top of your bread is covered with the cheese. Place your bread in your preheated 400* oven for 12-15 minutes. While the bread is in the oven you should begin your basalmic vinegar reduction. I didn’t complete this step and it turned out fine. Maybe next time I’ll try this. You start with 1/2 cup basalmic vinegar in a saucepan, bring it to a boil then reduce to a simmer until the vinegar is reduced by about half. 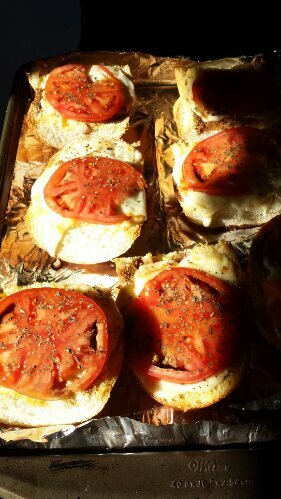 When your cheese is melted on your bread, slice some tomatoes and place them on the bread. The recipe called for fresh basil, which my kitchen doesn’t quite run to. I used basil out of my spice rack and drizzle with your basalmic vinegar. Season with salt and pepper to taste. We didn’t use any s&p and it still tasted amazing! Arthur ate all of his. 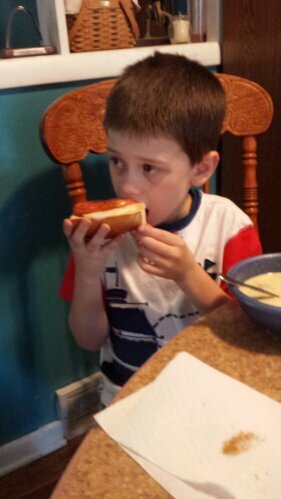 At first he wasn’t too keen on the idea, but I told him to think of it as a little pizza and he devoured it. 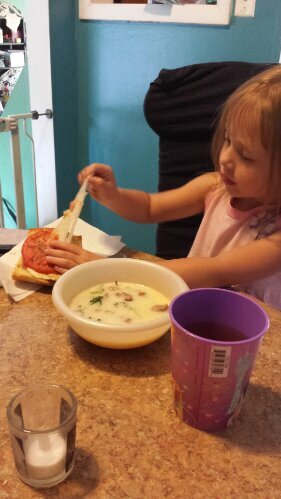 Chiara devoured the cheese, she is a cheese hog, picked the tomato off and nibbled the bread until it was gone. She is such a goober. Tony had two slices and I made a pig of myself and ate three slices. I was so full afterwards, but I can’t even feel bad about it because it was so tasty! Must try! Be sure to check it out. Don’t forget to check me out on Pinterest, under Stephanie DeSantis, and maybe suggest what pin I should try next…..